Francis and Arlette Tshibangu had a baby recently. Not just any baby, but a white baby. Now, you must wonder, what's the big deal. There was a bunch of news coverage of anther white baby born in the U.K. recently, so why is the birth of another white baby news? Well, this one's parents are black. 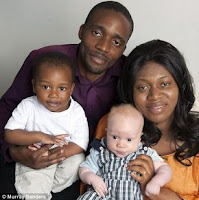 According to the Daily Mail -- yes, that's a real thing, not something The Beatles made up for a song -- the black couple were surprised when Mrs. Tshinbangu gave birth to a white baby. At least, Mr. Tshinbangu was surprised. Doctors say the baby is a mutation. I'm sure that's one explanation. I'm not suggesting that Mrs. Tshinbangu was unfaithful to her husband, either. I'm thinking it may simply be that the baby is racist. For years, some people have been operating as if only whites can be racist. Some go so far as to say that whites are born racist. Others have said that is racist in itself, and that people of any race can be racist. Which that first group says is racist. Well, what if everyone is right? Any race can be racist, but only white people? This baby seems to prove it. He's a born racist, is black, and because he's a born racist, is white. See? It all makes sense. Anything can be explained by Science! huh...so you're saying that being black is a choice? Just like being gay? Now you're just being racist. Doctors say the baby is a mutation. The mutant baby apocalypse is upon us! Like maybe he'll be able to spring claws out or shoot power blasts from his eyes? Or maybe he'll be really strong and later he'll turn blue and fuzzy. Keep an eye on this kid. Insatiable appetite for mayo and oatmeal, and accelerated I Q as a result. Can't stand the sight of Arizona Watermelon Juice Drink, Skittles, Fanta Orange, or collards. Refuses all types of cough syrup. Turns out to be a really good driver and stops at all the red lights. Never stands in the middle of any grocery aisle and blocks said aisle for hours on-end. Actually watches movies and shuts-up when they're on. When this process is completed, they'll have no choice but to set him/her free, to become America's New Poster Child. They named him Navin Johnson Tshinbangu. If they think they baby is a mutant, does it have any special powers? Aside from being white? He's the only one in the family not allowed to say the n-word. I notice that both kids must be mutants in that they don't have droopy "I'm on drugs" eyelids like their parents. ...I smell a "The Jerk" remake!!! I'm confused. Is this family diverse, or not diverse? Damn. This means he can't defend himself if he's attacked by a black teenager. @Basil - you're 1/3 of the way there. DamnCat: Niacin? I don't get it. They win. I thought "white Hispanic" was stupid. Now this comes up. And I can't think of a Beatles song that mentions the Daily Mail. So this is the second white baby born to black parents in the last 3 or 4 years. And I think both cases were in England, IIRC. I thought the first time it happened they said the odds were like 1 in 5 billion or so. Either they need to refigure those odds, or somebody needs to start buying some lottery tickets.